Boil 3 cups vegetable broth and whisk in cornmeal until there are no lumps. Then reduce heat to a simmer and cover for 5 minutes to thicken. Cover and cook for about 30 minutes stirring every 5 minutes to ensure the polenta is not burning or sticking to the bottom. Add the other cup of veggie broth when necessary. Remove from heat and stir in the vegan cheese and earth balance, sprinkle in salt, pepper, and garlic powder to taste. Transfer to a lined baking sheet, spread evenly, and refrigerate until set, about 1 hour. When set, cut into squares and fry in a non-stick skillet with olive oil. While that's frying, slice the tomato, steam the kale and mix a 1/2 teaspoon chili powder into 1/4 cup vegenaise with a Tablespoon maple syrup. 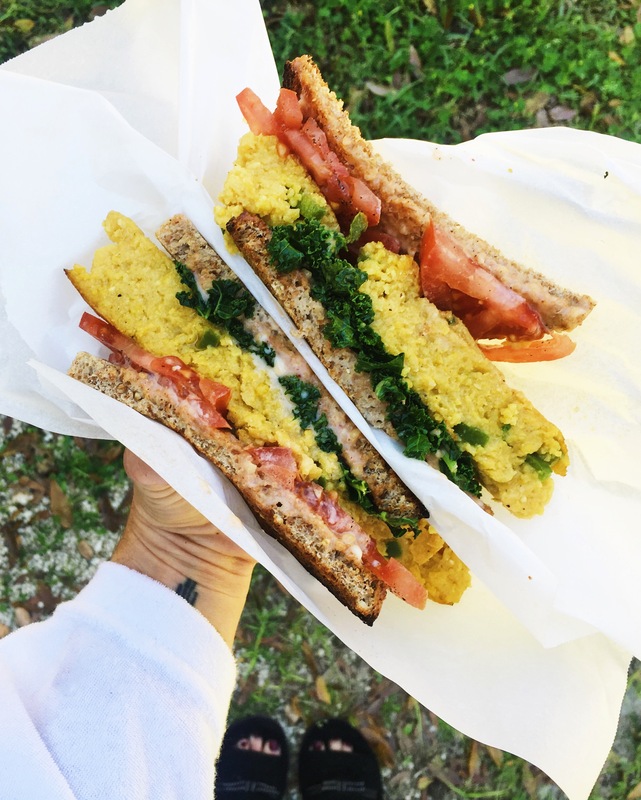 Spread the smokey sweet sauce on both halves of bread and layer the kale, polenta and sliced tomato.